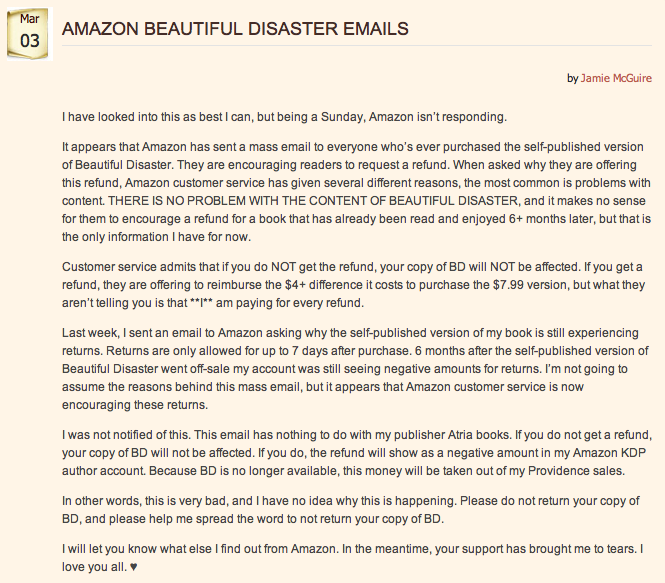 Amazon’s “Beautiful Disaster” Strike 3? While the author, Jamie McGuire states that one of Amazon’s problems with her book is “content,” and other trusted publishing blogs including this post at The Passive Voice and this one at Author Marketing Experts, Inc. hint at song lyric copyright issues being the primary “content” issue, all of these ideas are simply speculation as Amazon has kept conveniently silent, even to the author. In my opinion, a publisher and/or author should be informed as to any issues with their book, especially legal issues. What if Amazon had caught a copyright infringement issue when the book was still in distribution as a self-published title? Would they require the author to pay their profits as well as hers back? And would they inform her and let her correct the book? First of all, if the author is being required to pay back the full retail price, plus the difference in her newly published book, where’s Amazon’s cut? Amazon took at least 35% from all her sales, so are they just pocketing that money? Why should authors be forced to pay back Amazon’s profits? Secondly, in more recent news, Amazon has since said one point on their initial email to Jamie’s readers was a mistake, that being that the eBook would disappear from their Kindles if they didn’t request a refund and repurchase the new published edition. Why is Amazon now saying that if people don’t request a refund, their self-pubbed version of the eBook will remain intact and not disappear from their Kindles? If it really is a song lyrics content issue, since the self-pubbed version isn’t available anymore with any sort of lyric fix, Amazon should not say that version will remain intact. That is inciting further copyright infringement. If copyright issues are the true reason for this entire fiasco, chances are Amazon does have to pick up the fees for infringement, which would go a long way toward explaining why they’re demanding the author, whose initial fault it was, to pay up. But the way they’re doing it, by not informing the author who was the initial publisher what is really the root issue, disrupting her life as a professional and then sending a simple, non-explanatory apology saying the initial email they sent was a “mistake,” is one more reason authors shouldn’t put all their eggs in one basket with Amazon’s publishing services. There’s nothing more dangerous than the power of one company to monopolize and make or destroy people’s reputations and livelihoods on a whim. I’m not saying Amazon should be perfect. I’m just saying they should responsibly tell the author what the actual issue is, rather than beating around the bush and expecting the author to pay up for something that may not even have been her mistake to begin with. Technically Amazon was the publisher as the first self-pub edition was “published by CreateSpace.” Self-published and “published by” are two different things, though the industry has mucked the terms to be interchangeable. This author wasn’t independently published (that I know of) under her own name, and I do agree that ultimately the author is liable, as is evident in CS’ contract. However, my point with this post is that Amazon has a lot of power, and they should be willing to communicate with authors. Unfortunately most authors don’t know squat when it comes to copyright law, so if an entity like Amazon finds something wrong with a book an author uses their services to publish, they should let the author know there’s an issue and exactly what that issue is so the author can fix it. Instead Amazon told the author there was an “issue with content” but not what that issue is (and this is not the first time I’ve seen this exact same message happen between Amazon and an author). 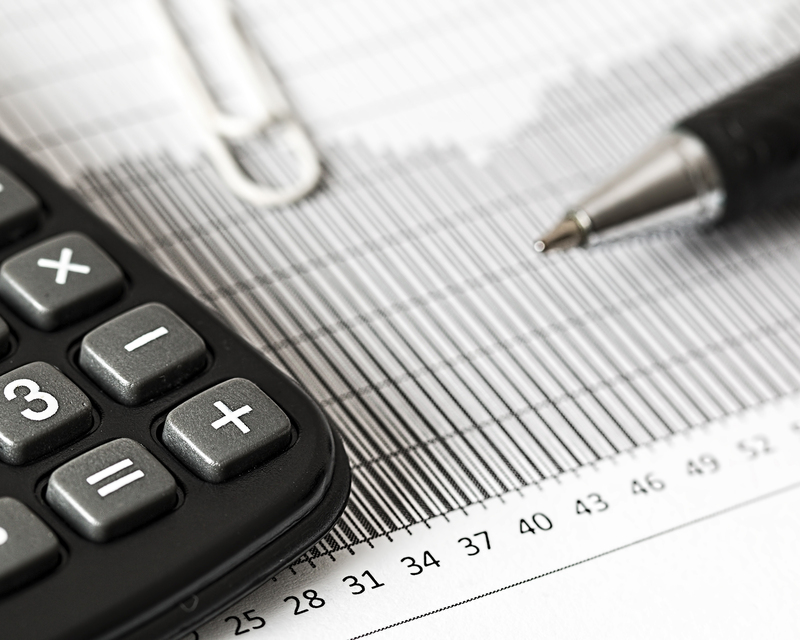 Maybe I’m old school in thinking the publishing company or service provider should look out for their clients, and that’s a major issue I feel is very wrong in the vanity publishing world today. Authors aren’t educated, these companies refuse to even vet their books and publish them anyway just to make a buck, and authors end up paying the price. Hopefully this will be a lesson to all aspiring authors to do their due diligence when it comes to copyright law and other potential legal issues. And yes, once again, that copyright issue is still pure speculation. Great post, Kristen! When we see a behemoth like Amazon creating an uproar with explaining the reasons for their decisions, it creates all kinds of mostly unnecessary conjecture. We, as authors – and self-publishers – must take full responsibility for what goes out under our names.